When not bustling with the National Western Stock Show activities, the Livestock Center will serve as a multiuse facility for small concerts and other events. When the National Western Stock Show crowds depart each January and no special event is going on, the stock show complex can seem a little sleepy. That won’t be the case for long, with major infrastructure work beginning for the 250-acre National Western Center. The first two phases of construction, costing $756 million, will stretch over the next seven years. The collaborative effort of the city and county of Denver, Colorado State University and Western Stock Show Association will transform the campus along Interstate 70 into a year-round destination drawing hundreds of thousands of new visitors each year. Beyond competitions and entertainment, it will be a place for education, research and business. The redevelopment also will preserve historic buildings, connect the site to the South Platte River and surrounding neighborhoods, and potentially create one of the largest campuses to be powered by renewable energy. That will be accomplished in part by capturing heat from a huge sewage pipe that runs alongside the river and that will be buried as part of the redevelopment. “Between the heat of that pipe and solar, we believe that we’ll provide a net zero energy solution for that campus, the first of its kind in Denver,” Gretchen Hollrah, executive director of the Mayor’s Office of the National Western Center, said during a recent media tour of the site. Major assets within the National Western Center’s first two phases will include redevelopment of the stockyards, beginning after next year’s stock show, along with construction of a 508,000-square-foot, year-round Equestrian Center with 1,050 below-grade parking spaces, and a Livestock Center, including an equestrian barn and arenas. When not in use for the stock show, the 325,000-sf Livestock Center will provide multiuse space for small concerts and other events. The Equestrian Center – a quarter-mile-long structure – will break ground in 2019. Also next year, CSU will break ground on its Water Resource Center, which will be the first building to be completed on campus and the first of three buildings in the CSU Center. Still in design, the building will be used for collaborative research and education regarding water quality, conservation and treatment, for instance, and involves partnerships with Denver Water and others. The building also will host water conferences and other events. CSU, which will own its own facilities, will break ground in 2020 on its second building, the CSU Animal Health Facility, which will house K-12 education facilities and programs, equine sports medicine, equine assisted activities and therapies and a small-animal community outreach clinic. The university’s final development will be a facility focused around food systems and innovation. The stock show association, which owns and operates the National Western Stock Show, currently is in the process of raising funds for a privately funded, approximately 110,000-sf, four-story Legacy Building to house its Western art collection, a heritage center and WSSA administration offices, along with executive board room, flexible exhibit space and a new National Western Club with seating for around 700. Plans are to connect the building to the Livestock Arena in the initial phases of National Western Center development, so construction will occur concurrently. Also, as part of the campus infrastructure work to make way for new development, rail lines are being consolidated in the center of the site, which will have a station on the new North Metro Rail Line between Denver Union Station and north Adams County. 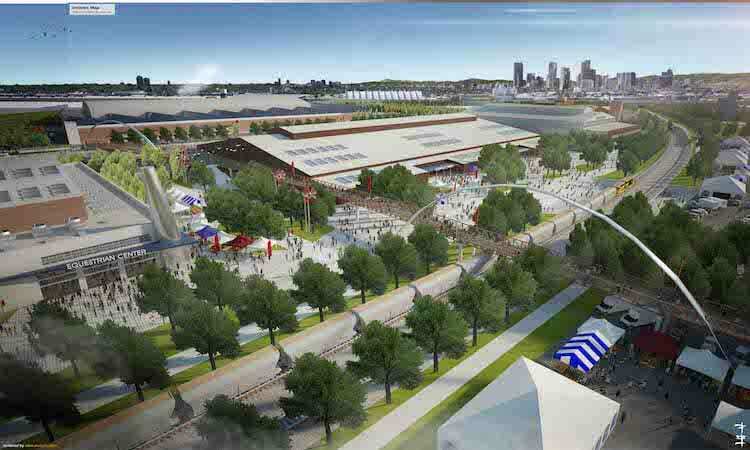 The final piece to the National Western Center, a 60-acre parcel known as the Triangle, will include construction of a new 10,000-seat event center to replace the Denver Coliseum, along with a Trade Show and Exhibit Hall, structured parking and renovation of the historic 1909 Stadium Arena into a new use, possibly a public market similar to Pike Place Market in Seattle. A development partner is being sought to help deliver those buildings on about 18 acres and provide compatible development – which could include office, retail, hospitality, housing and other uses – on the remaining 42 acres. A request for qualifications is expected to go out late this year. National Western Center partners will be looking for innovation and creativity to deliver the required and associated uses on the Triangle site, and will engage in a very public process, just as was done in adopting the campus master plan, said Hollrah.